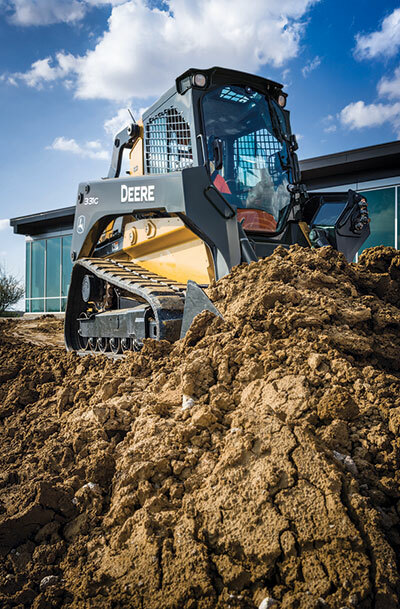 Landscape contractors share their approaches to purchasing compact construction equipment and attachments. When a job calls for some heavy lifting or digging, it’s time to crank up the compact equipment and connect the attachments. But before landscape contractors can dig into their next projects, they’ve got to make sure they have the right machines for the job their companies’ needs. There’s no set way for landscape professionals to go about getting new equipment, since much of how and what they buy depends on their company’s budget, size, schedule and project scope. There are some tried-and-true methods to consider when it comes time to add compact equipment and attachments. Here’s how three contractors handle purchasing equipment and what trends they are seeing with these machines. There are some benefits to having the same makes and models throughout a fleet—just ask Steven Johns, owner of Envisioning Green in Caseyville, Ill.
“What’s important to us is the consistency—having the same model, same year—from crew to crew,” says Johns, who uses John Deere equipment. “That’s why we buy in big groups.” The uniformity helps with safety, maintenance and ease of use from one job site to the next, he explains. Serving residential and commercial clients in both Illinois and Missouri, Envisioning Green provides design/build, lighting, maintenance, pools and snow services. The company’s annual revenue is $2.5 million and growing. Part of that growth has helped the company expand its fleet. In 2016, Johns bought three track loaders, one enclosed-cab wheel loader, two compact skid-steers and one compact excavator. As for attachments, Johns has a wide range including rakes, trenchers, augers, forks, nursery jaws and buckets. Johns keeps a list of all of the equipment and attachments he thinks the company will need going forward on Evernote, a note-taking app, to share with the team. He also relies on his crews to tell him what they need to add to the fleet. Johns buys all his equipment. He says it’s a good option (compared to leasing) for his company and others that are committed to taking care of their machines until they’re ready to resell. “When you lease, it’s not your problem if something goes wrong with the equipment, so people don’t really care about (maintenance) as much,” Johns says. His crews can submit a ticket to their in-house maintenance worker using an app. This method helps keep maintenance a streamlined process. Johns’ biggest piece of advice for other landscape contractors is to try the equipment before they buy it, taking advantage of short and long demo opportunities dealers offer. Beyond the front-end concerns of purchasing equipment, it’s important for owners to consider long-term aspects like service when deciding on a manufacturer and machines. Johns says when his company purchased new machines, the dealer sales rep attended one of his company meetings to train his team on the ins and outs of the equipment. Some landscape contractors have their equipment-buying schedules nearly down to a science, like Matt Hutton, owner of Hutton’s Landscapes in Savannah, Ga.
His company works with builders and offers design/build, irrigation, erosion control, dump truck, maintenance and chemical services. The company’s annual revenue is $16 million, and he also has a full-size concrete company. 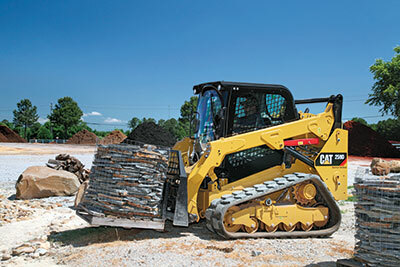 Hutton’s fleet includes equipment like JCB loaders, compact excavators and skid-steers. He also uses attachments like rakes, buckets, pallet forks, concrete hammers, tree booms and augers. “We are more structured now and generally revolve equipment out every three years,” he says. The company leases its equipment with the intention of getting a low buyout in the future, so it can own the machines. “I want to stay ahead of the debt curve,” Hutton says. When it comes to choosing a brand, Hutton says it’s important to go with a supplier that’s committed to getting the machines back up and moving again quickly. “You’re going to wear out undercarriages and other components, so service is huge,” he says. Equipment and attachments are a big investment, so finding a company that can help with financing options is imperative, says Bill Kirk, owner of Kirksway Farms in Lansing, N.Y. He offers residential services like septic, drainage work, light excavation, fencing and lawn installation. The company has annual revenue of $500,000. Kirk has a range of equipment both large and compact, including skid-steers and excavators. He uses attachments like augers, rock rakes, landscape rakes and buckets. He purchases a few staple pieces of equipment and attachments, and he rents items the company doesn’t use very often. “I might get attachments from a rental company that I can’t justify having around,” Kirk says. When it comes to purchasing equipment and servicing current machines, Kirk relies on the relationship he’s built with his dealer. He looks to buy equipment as needed, mainly early in the year. “We try to figure out what we’ll need in the future and then order it at least a few months out,” Kirk says. With decades in the industry, Kirk has seen the evolution of equipment. He says he enjoys some of the newer comfort features and also components that help secure the equipment, like keypads. But one thing Kirk wishes compact equipment would have—compared to their larger counterparts—is GPS built in.